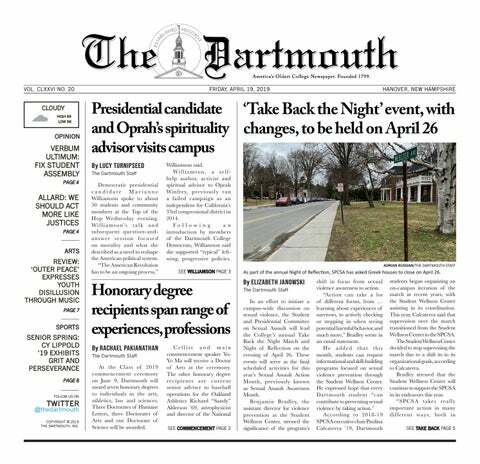 As the workplace becomes increasingly competitive, the standard grade point average at Dartmouth has gradually risen. According to a report published by the Committee on Instruction last winter, the average Dartmouth grade point average has increased by 11.48 percent across departments – from 3.05 to 3.40 since the 1970s. While high ranks do look good on a resume, grade inflation comes with a trade-off: distinction. If grade point averages do not begin stabilizing, dicerning the merit between students’ transcripts will become increasingly difficult, biology professor Mark McPeek — who has studied the rising trend in the grades of Dartmouth undergraduates since 1973— said. “Students, rightly, want to look as good as they can, but grades are also information to the students,” McPeek said. Inflated grades are not fair feedback to students, he added. If a transcript reports all As in a variety of disciplines and classes, the transcript tells the student that he or she may excel at everything, which is inconclusive at best. Alternatively, low class medians may deter students from taking classes they have interest in, limiting intellectual exploration, McPeek said. The College’s Organization, Regulations and Courses handbook outlines grade descriptions, but these explanations leave room for professors to excercise their own judgment. For example, in the history department, individual professors have authority over student evaluation in all history class with two exceptions: the foreign study and honors’ programs, history department chair Robert Bonner said. Mathematics professor John Voight said that he interprets grades as a measure of a student’s mastery of a particular subject, and uses citations to indicate exceptionally high achievements. While Colletti’s research proposes that professors may feel an obligation to please their students with high grades, not all faculty members agree that this pressure exists. “I haven’t felt that I’m under pressure to raise my grades,” associate history professor Edward Miller said. He added that, although he gives a wide variety of grades to students, he has received positive feedback regarding his classes from both students and colleagues. As a chemistry major, Brendan Wang ’15 has enrolled in classes with low median grades, yet median grades still influence his decision when enrolling for classes outside his major. “I go for content, but median is a tiebreaker,” Wang said. For Vivian Lee ’18, median grades don’t matter as much as her relationship with and the quality of the professor. “I have found that I do best in a class when the professor is good, no matter how interested I am in the class,” Lee said. While some professors said that think they should award all good work, others said that they believe it’s important to distinguish between the work of students. Whether those distinctions are purposefully drawn or fall naturally depends on the class. Employers value students’ grade point averages to varying degrees. At Hypertherm, the hiring process not only focuses on knowledge and skill, but also on “soft skills,” such as the ability to plan goals, self-awareness and integrity, she added. Ted Schroeder, senior analyst at healthcare consulting firm CBPartners, views grade point average as an important factor when evaluating candidates, along with a student’s major, college, experience, personality and fit. He also addressed the issue of grade inflation in assessing the real significance of a grade point average. “Regarding grade inflation — that’s something that we’re aware of, but it’s not something we consider to be a major factor, because inflation or deflation varies across schools and we’re pretty much always evaluating candidates from across institutions,” Schroeder said. McPeek said that faculty members are never taught how to “give grades.” This is a source of the grade inflation problem, he added, proposing that each department publish the distribution of their grades online. Full knowledge of grades could be used to adjust grade point average expectations based on departments, he said. Grade inflation is a difficulty not only found at Dartmouth. Other schools have attempted to combat rising grades in various ways. From fall 2004 to spring 2014, Princeton University restricted the percentage of As rewarded in undergraduate courses to no more than 35 percent. Princeton revoked this policy prior to the fall 2014 semester. In December 2013, the median grade at Harvard University was reported at an A minus. This became a common practical joke, and a website called “What would my Harvard grade be?” that featured only a giant red “A” in the center of the page was created.